It’s funny how something like that works. When I got home, I typed up a commentary and posted it on my old website. This was a long time ago, and I never went back and read it until the day I typed this sermon. Lots of stuff on that old site that I have no idea about anymore. But, for the most part, my thoughts, even back then were correct about what we are being shown. Unfortunately, the symbolism was shoddy at best, and so after finishing the study for this sermon, I went back to the old site and deleted the page. It would be fine for a general understanding of the passage, but with some incorrect pictures, I couldn’t let the thing remain. Studying a passage word by word and verse by verse brings out much more exacting pictures of what the Lord is trying to tell us. But as I said, the major idea of the passage was correct. It is symbolic of other things that are going on in redemptive history, and all which point to Christ, and our relationship with Him. And the house of the one who swears falsely by My name. In this passage from Zechariah, it speaks of consuming a house, with its timbers and its stones. The same terminology is used back here in Leviticus. The Lord there shows us that sin, in that case thievery and perjury, are what brought about the curse, and that curse results in the destruction of the house. Knowing this gives us a general idea of what is being relayed back here in Leviticus. The word of the Lord is consistent, and one passage will often lead us to a fuller understanding of other passages. However, we still need to be careful with our evaluations of what is going on, and – as I learned from my old website page on this passage – we need to be sure to not trust everything we read. Something may sound convincing, but it can also have error in it, just like my old page about this very passage. Everything needs to be checked and verified, and everything needs to be carefully evaluated from time to time, lest our doctrine gets off course. I don’t regret posting that old page. There is a time where we simply need to write about what we know. Even the older Genesis sermons are like this. I can go back and see how quickly I went through them and how much I missed. If I could do the book all over again, I would. But the evaluation is done and the Lord will judge it with His perfect knowledge of my submissions. What is correct will be worth a reward, and what is incorrect will be burned up and gone. He is the Judge, and so to Him we need to give our very best in all things. But we are His children through faith in Him, and so where we are wrong, He will graciously correct us as a Father would to His own children. I’m glad about that because James 3:1 says that teachers will be held to a stricter judgment. I pray that each thing I submit henceforth is worthy of a thumbs up on that Day. His word is precious, and its truths are wonderful. Let us cherish it always and hide it deep in our hearts. Great things are to be found in His superior word. And so let’s turn to that precious word once again and… May God speak to us through His word today and may His glorious name ever be praised. Like verse 13:1, the address is now again made to both Moses and Aaron. What is ahead discusses defilement and ritual purification of houses. It is a law coming from the Lord, and therefore it is given through the lawgiver, Moses, but it deals with a new section under the leprosy law, including priestly purification, and so Aaron is also addressed. As one can see, Moses and Aaron are jointly addressed at the giving of the laws which concern overall defilement. First of people and of garments, and then of houses. This is the first time that eretz kenaan, or “the land of Canaan” is mentioned in Leviticus. The Lord had promised to bring them to this land in Exodus, and that was based on a previous promise to the patriarchs that their descendants would be returned there. Several times in Exodus, the promise was that the Lord would drive out the inhabitants there. This verse in Leviticus now confirms that this will surely be the case. It is taken as a given that they will enter, they will disposes, and they will dwell there. There is no “if” involved. v’natati nega tsaraat – “and I put plague leprosy.” The Lord specifically says that He is the one to put a plague upon the house. Here the Lord claims authority not only over the people, but over their possessions, which extends even to their houses. They were to sanctify themselves, they were to have their garments undefiled, and they were to have their houses kept pure and undefiled as well. And then, having said that, it is claimed by ancient Jewish writers that, like the leprosy in the garments, that this is a unique leprosy not found anywhere else. Thus it is a type of divine judgment upon the people of the land for various infractions against the moral code. Whether that is true or not can not be known today. What the leprosy here pictures, however, is clearly symbolic in nature, as will be seen with the verses to come. What is evident here is that even if the person is certain that he has leprosy in his house, as is described by the law, it is not for him to make the determination. I can know that someone in my house has the flu, but we still take him to the doctor who gets out that annoying nasal swab, and does his swipe. After that, a confirmation is made, and the appropriate remedy is prescribed. This is the law because only some have the authority to prescribe medicines. In Israel, only the priest had the authority to confirm the plague and prescribe the cure. In type, we can see that our sick condition of sin may be known to us, but it is the Lord who confirms that state, and it is He who determines the cure. It is not up to us, but to the Lord, to select the healing remedy or the judgment to be imposed. 36 then the priest shall command that they empty the house, before the priest goes into it to examine the plague, that all that is in the house may not be made unclean; and afterward the priest shall go in to examine the house. This verse actually takes a bit of consideration. There is leprosy in the house, but the priest has not yet proclaimed the house as such. And so before going in to do so, he gives the command that the entire house be emptied. Anything left in there, after the house is declared unclean, will also be declared unclean. Therefore, the law, as such, did not consider the leprosy as infectious in and of itself. This kindness of having the goods removed, was to keep from there being unnecessary loss, which would otherwise be the case. However, we can see that because the leprosy was declared as such when the priest says so, this is obviously a symbolic type of plague. In picture, we already know that leprosy indicates sin. Therefore, we can see presented here sins which are open, obvious, and can spread. With the house emptied, the priest alone was to examine the plague. In this, he was to look for certain specific signs of infection. The first is ingrained streaks. The word is sheqaarurah, a word found here and nowhere else. Hello and goodbye to it. There are two possible roots for the word. The first is qara, meaning to tear. Thus it indicates a look as if streaks have been torn from the wall. The second is shaqa, meaning to sink. Thus it would indicate depressions in the wall. This affliction of the wall then corresponds to the affliction of the leper in verse 13:3, where the leprosy was deeper than the skin. And so either way, these depressions will be greenish or reddish. The word “greenish” is yeraqraq. It was first seen in verse 13:49. It is believed to give the sense of having a yellowish tone to it rather than being fully green. Although it is such a rare word that there is disagreement on this. The last use of it is in Psalm 68 when describing gold, and so it probably means either yellowish or glistening. The word “reddish” is adamdam. It has been seen five times so far in the Bible, since verse 13:19. This is now the sixth and last time it will be seen. You can bid this word adieu. Finally, it says that the streaks appear to be deep in the wall. The word is shaphal, and it was first seen in 13:20. In all, this matches the infection of leprosy in man. It is symbolic of an infection which is displayed in unclean works. There is a turning, or a perversion of what should exist. 38 then the priest shall go out of the house, to the door of the house, and shut up the house seven days. This corresponds to shutting up the leper or the leprous garment. An interval is given to determine if any change has taken place. 40 then the priest shall command that they take away the stones in which is the plague, and they shall cast them into an unclean place outside the city. There is a pronouncement of uncleanness. However, it is not total. Rather, there is a hoped-for remedy to the situation, which is to merely remove any plagued stones, and cast them to a place set apart as unclean, and which is outside the city. The word for “take away,” as in taking away the stones, is a new word, khalats. It gives the sense of pulling off, but it is normally used in the Bible as being armed, or prepared for battle. The reason is that a person is being pulled off regular life when being counted among the ranks of the army. In the case of these stones, they are being pulled off from what they were purposed for – a home which was to be a clean place – and they are to be cast into a place which is unclean. Being in an unclean place, they would never again be of use for any purpose. 41 And he shall cause the house to be scraped inside, all around, and the dust that they scrape off they shall pour out in an unclean place outside the city. Here we have another new word, qatsa, or scrape. It will only be seen here and in Ezekiel 46:22 where it is translated as corner. Like this, a second new word, qatsah, is also used. It is very similar to the other word, with a meaning to cut off or scrape off. What is to happen here is that the entire inside of the house was to be scraped. The house has had a leprous plague, and thus the inside is unclean, just as the furniture would have been if it was still inside. By removing the infected rocks first, no other rocks would be deemed unclean. Such would not be the case if the house was scraped first. If that was the case, then all the rock walls would be considered unclean. The very dust from which man was taken which is defiled by sin will be scraped off as unclean, and it will be cast into an unclean place where there is only destruction. 42 Then they shall take other stones and put them in the place of those stones, and he shall take other mortar and plaster the house. The Hebrew reads, “And they shall take stones other and put them in the place the stones, and dust other he shall take and overlay the house.” The word for “plaster” is a new one, tuakh. It means to overlay, overspread, besmear, and so forth. What needs to be seen here is that the term brick has not been used at any time. A brick is something made by man. But abanim, or stones, and aphar, or dust, are both made by God. Certainly a picture is being made here, or it would have surely said, the stones or the bricks. What is also necessary to highlight is that there are eight verbs used in this process in verses 40-42. Six are plural – “they shall take & they shall cast” of verse 40; “they shall scrape & they shall pour” of verse 41; “they shall take & they shall put” of verse 42. Two are singular – “he shall take & he shall plaster” in verse 42. 44 then the priest shall come and look; and indeed if the plague has spread in the house, it is an active leprosy in the house. It is unclean. 45 And he shall break down the house, its stones, its timber, and all the plaster of the house, and he shall carry them outside the city to an unclean place. The action here is the same as condemning a leper as unclean and thus being excluded from the camp, or for a garment where the plague reappears and which is then to be destroyed. 46 Moreover he who goes into the house at all while it is shut up shall be unclean until evening. This corresponds to verse 11:39 where a person who touches a dead animal is unclean until evening. A house which had been declared leprous conveyed its unclean state to any who entered it, but it was an uncleanness of such a slight nature that it ceased in the evening. As we have seen, if someone went in at 7am or 5pm, the same uncleanness lasted only until the evening. As we saw before, this term, “until the evening,” looks forward to the work of Christ in the believer. At the end of the age, all defilement will cease, whether a person came to Him on the day of Firstfruits after His resurrection, or 1 second before the rapture. There is a set time where all will be declared fully cleansed actually, just as we are now in Christ positionally. 47 And he who lies down in the house shall wash his clothes, and he who eats in the house shall wash his clothes. The same defilement for eating the carcass of an animal that dies naturally, or carrying such a carcass (11:40) is seen here. What verses 46 & 47 show us is that there is no consideration of infection, but rather there is merely symbolic uncleanness which results from these actions. And in reality, it is the law itself which makes the people unclean through their actions. If the law did not say this, then there would be nothing to declare them unclean. Once the law was introduced though, uncleanness for such a thing caused the defilement to be considered. Thus, this is showing us, as it has continuously, that the law itself, and all of its precepts, are merely pointing to spiritual truths about moral uncleanness in the world around us. A house is something in which people dwell. For Israel of old, the house was a place for home and family, meals and memories, sleeping and swapping stories. If a leprous sore was found in it, the actions required by the law were taken. These were, like everything we have seen, simply pictures of spiritual things. In the New Covenant of Christ, a house represents on a smaller scale, the local church. Quite a few times, Paul mentions in his letters to greet the saints who meet in this house or that. Thus the house was the place of meeting. On a larger scale, the house of God speaks of the church as a whole. It is the smaller houses to which these pictures are directed. Even today, we often hear people say, “We’re off to the house of God” when speaking of the Superior Word, Sarasota’s precious local church. The land of Canaan symbolizes the land possessed by the Lord. It is where the people of God live. This then is any place where the people of God now congregate as a church. In such a place, churches take root and meet. But it is certain that everywhere they meet, a plague of sin is bound to appear. This type of sin is obvious, it is marked by certain traits which cannot be hidden, and it is a deep infection, all indicated by the words describing it. It is one that tears at the church and causes it to sink into a state of unholiness rather than purity. Reading the seven letters to the seven churches of Revelation shows us this quite clearly. The infection sets in, and the Lord warns that it needs to be excised. When such an infection then arises, it needs to be isolated. In 1 Corinthians 5, Paul instructed the church about a member who was engaged in sexual immorality. When such a plague is identified, it is to be shut up and evaluated. In Israel, the priest using the law as his guide would do his evaluation. In the church, the Lord, through His word identifies that which is plagued. The fact is that a person in Israel could simply ignore the plague and let it fester, and nobody else would be any the wiser. This doesn’t negate the plague’s existence, it simply means that the person refuses to acknowledge what is obvious. This would be most of the mainstream churches of this day. They will eventually be dealt with. They will be destroyed entirely, to their last stone and timber. All will be cast into the burning Lake of Fire. It’s a sad commentary on what will be the fate of many churches which have ignored the word of the Lord. A church is a house; people are stones from which it is made. When the stones have a plague, they are to be removed. As I said, only the word abanim, or “stones,” and the word aphar, or “dust” are used here. These are created by God. They are His, and thus there is symbolically no works involved in the process of building His house. Christ determines what His house is constructed of. When people are filled with unrepentant sin, they are to be excised from the church. After that, the church is to be given instructions in what necessitated the removal of the offenders, symbolized by the removal of the defiled plaster. After that, the church can add its replacement stones and be re-covered with sound doctrine. However, there is the obvious possibility that the problem is systemic. The doctrine is unsound, the infection is too deep. Such a church is of no value to the Lord. It will have its lampstand removed, it will be destroyed, it along with all who are in it. They will be sent to an unclean place. This is true with the church that doesn’t reveal it’s leprous plague as well. As I said, a person could have such a plague in his house and ignore it. That doesn’t negate the unclean state of it, nor does it negate the Lord’s judgment. Hiding unrepentant sin in a church is no different than exposing it openly for all to see. In the end, the infection will be destroyed. This process explains the use of the plural and singular verbs in verses 40-42. The church as a whole removes the stones, or expels the offenders. They together remove any offending doctrine and begin again with a clean slate, even bringing in new members. This is reflected by the use of the plural in 1 Corinthians 5, for example. As a church, they are to do these things. It also fits with Jesus speaking to the church as a whole in the letters to the seven churches. However, the elder of the church is responsible for ensuring that the new direction is sound, symbolized by the taking of the mortar and the plastering of the house. This is reflected in the pastoral epistles where the words of doctrine and instruction are provided for the one responsible for these matters. In the end, the one responsible for the working of the church will have his church destroyed if he does not take care of the lingering infections in it. 48 “But if the priest comes in and examines it, and indeed the plague has not spread in the house after the house was plastered, then the priest shall pronounce the house clean, because the plague is healed. 49 And he shall take, to cleanse the house, two birds, cedar wood, scarlet, and hyssop. This verse is very similar to verse 14:4. The only major difference is the birds there are described as alive and clean. This however is now understood, and thus unnecessary. The same pictures for the same things, and having the same meanings are seen in these items. This verse corresponds directly to verse 14:5. 51 and he shall take the cedar wood, the hyssop, the scarlet, and the living bird, and dip them in the blood of the slain bird and in the running water, and sprinkle the house seven times. Though not in the same order of items mentioned in verse 6, the same procedures are followed here that were followed then. Everything here carries the same marvelous symbolism of the cleansing ritual we looked at then, and which encompassed verses 1-9. If you didn’t see that sermon, your instructions for this afternoon should be clear… go catch up. 52 And he shall cleanse the house with the blood of the bird and the running water and the living bird, with the cedar wood, the hyssop, and the scarlet. In verse 7, the leper was sprinkled seven times. Here the house is sprinkled seven times. But the same symbolism carries through for the cleansed leper as is now seen for the cleansed house. 53 Then he shall let the living bird loose outside the city in the open field, and make atonement for the house, and it shall be clean. The wonderful letting loose of the second bird, and all the marvel it pictures, is seen for the house as well as for the leper. 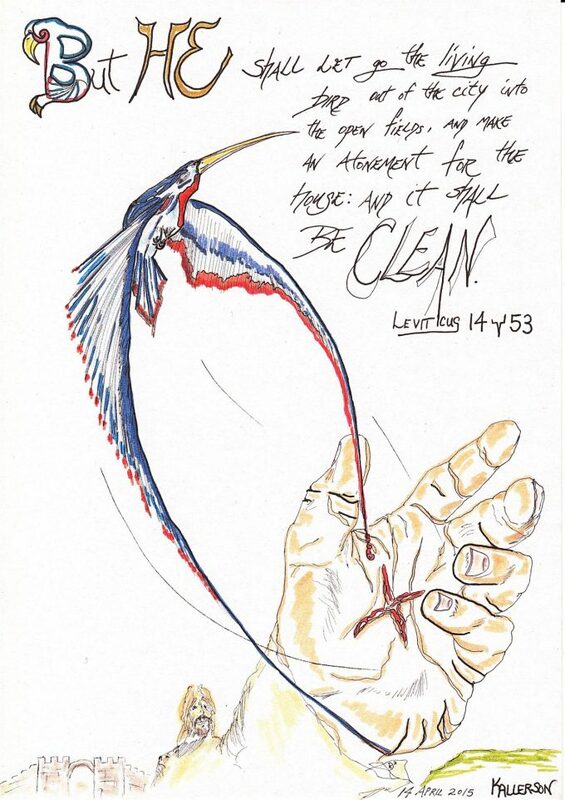 The bird is loosed in the open, atonement is made for the house, and it is declared clean. The infection is healed, the doctrine of the church is sound, its members are pure, and the Lord accepts them, having died for them and carried their sins away. In this, there is truly the sense of at-one-ment which is implied by the term atonement. There was a rift, the rift is healed, and a sense of unity between the Lord and His church is realized. It is symbolized in this purification ritual which was explained in detail in the sermon on verses 1-9. This and the next three verses are a summary of everything which has been seen in chapters 13 & 14. The sore is noted all the way through verses 13:2-46, but the scale is noted solely between verses 13:31-37 where it is mentioned 13 times in just those few verses. The leprosy of a garment is found in verses 13:47-59, and that of a house comprises most of our verses here in this sermon. These symptoms are a repeat of verse 13:2. This final verse is given as a note of closing over a matter which is obviously very on the mind of the Lord. A total of 116 verses have been dedicated to these two chapters to teach Israel a lesson concerning obedience to strict rules of maintaining holiness in the congregation, separating that which is pure from that which is defiled. But as we have seen, these things are mere shadows and types of real, spiritual infections which come up among people as individuals and as groups. The obvious thing that we see here in these two chapters is that the Lord has no tolerance of sin. He calls it a leprosy, He calls one infected with it a leper, He gives instructions on what to do to excise it, and if those instructions are not followed, He tells what the final remedy is – banishment from the people of God if a saved person; destruction if an unsaved person. The pictures have been exact, the wording has been precise, and the consequences for our disobedience are sure to come. My heart goes out to you today. If you are engaged in sin; if your life is being lived contrary to the word of God; and if you think that you have hidden it well enough to fool the Lord, you are mistaken. You are a leper and you are unclean. The Lord will search you out, and He will expose your infection. I plead with you now to take heed to these past two chapters and to come to the Lord for healing. If you have been saved, return to Him. If you have never called on Him, do so today. He truly loves you, and He truly desires the best for you – and your sin is not what He desires. Come to the cross and be restored through the blood of Christ. ———-Oh! What does it mean?